I have a Linksys WRTL54GL running the opensource firmware DD-WRT and have been quite happy with this up until recently. A short while back I upgraded my Internet connection to a 50/50 mbit and then the problems started. It turned out that the Linksys WRTL54GL can’t route much more than 30/30 mbit on the WAN side. 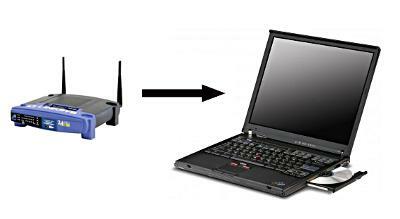 My old WRTL54GL router and my new Thinkpad T42 based router. At my work I had the option to buy a old retired Thinkpad T42 cheaply and I had and an old PCMCIA netcard lying around, so I figured I might as well put a router together myself using CentOs. I am aware that there are many router distributions available, see en.wikipedia.org/wiki/List_of_router_or_firewall_distributions, but I work with RHEL and CentOS daily and would like the freedom of not using a dedicated distribution. I have a picture of the services that the new router should be able to do manage. This is really not very demanding as I already have another server running NFS, CIFS, SSH, WWW any many other services. This could of course also have been done on my existing server but I found it more pleasing to have the router separated from sever that hosts data. Route WAN side with 100/100 mbit. Provide NAT (IP masquerading) for the clients on the LAN side. Serve as a local caching DNS server. Serve as a local DHCP server. Serve as a statefull firewall for my LAN. After this I completed the rest of the install. Now the router was running but none of the computers on the LAN side could access the Internet and the router it self was showing off everything to the Internet. Time to configure. # Number of IP's to cache. # Always give computers the same addreses. # Save some of the activity to a log file. Having a server running 24-7 can be annoying if not very silent. The Thinkpads fan was by default humming away at 3600 RPM even though the CPU usage is close to 0% all the time. By modifying the thinkpad_acpi driver to allow tinkering I can reduce this. First I add the following line to /etc/modprobe.conf to have the driver allow that I change the fan speed. After this I reboot to make the drive being reloaded. I do believe all the concepts you have presented on your post. They’re really convincing and can certainly work. Still, the posts are too brief for newbies. Could you please extend them a little from next time? Thank you for the post.